With a rolling pin roll the white bread flat. Boil 2 eggs and then shell and blend with mayo and curry spice and salt and pepper. Spread the egg mix over the bread evenly and not too thick. Spread the shaved iceberg lettuce over the egg and the roll up and wrap tightly with cling-film. To serve, remove cling-film and trim the ends of the sandwich. 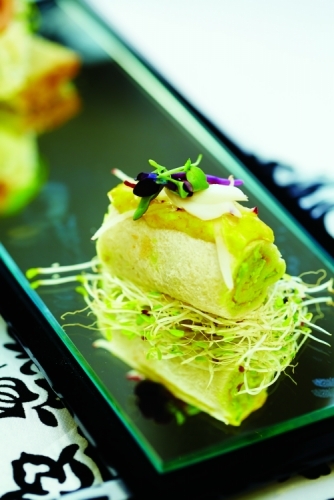 Using the garnish items, run down the spine of the pinwheel and place on alfalfa sprouts.